Closing out 2018, GKN Powder Metallurgy´s hydrogen storage project made its first public appearance when the technology was presented to an in-person audience. The engineering team traveled to Bolzano in South Tyrol, the host city of the annual Klimahouse trade show and conference; presenting state-of-the-art technologies and materials for sustainable buildings. With our pilot project Hy2Green based in South Tyrol, the Klimahouse was presented as the ideal platform to present Hy2green as the new identity for our hydrogen storage system focused on residential housing applications. See the first announcement of our Hy2Green hydrogen storage system here. 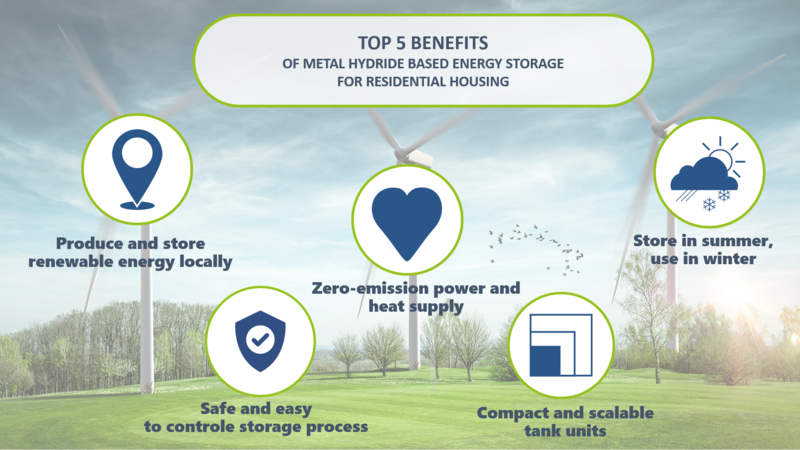 At Klimahouse, the metal powder-based hydrogen storage system peaked interest from home owners and stakeholders in the sustainable buildings sector - architects, housing companies and building service businesses. 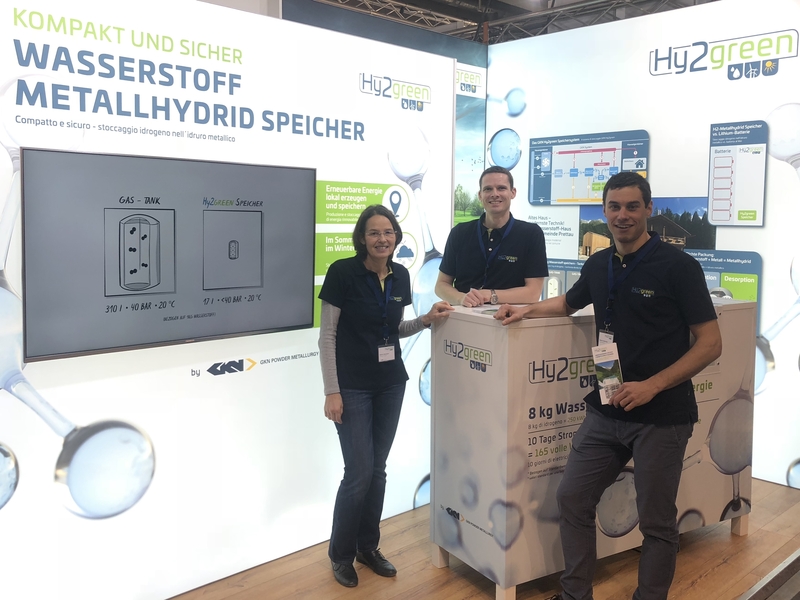 Nils and members of the GKN Powder Metallurgy Hydrogen team presenting the new Hy2green energy storage system at the Klimahouse2019 exhibition. From a technical perspective, the hydrogen team has passed an important milestone in the pilot project at an alpine chalet just weeks before the first exhibition. After the team overcame initial challenges and took important steps forward in the second half of 2018, the system went through a full cycle of producing hydrogen, storing it and converting it back to electricity. Now, the focus moves on to full validation of all modules and subsystems at varying load scenarios. The team is automating the process from energy conversion to storage and heat management. This will lead to further design optimizations to ultimately create a comfortable plug-and-play system at an improved efficiency, smaller size and simple control interface. As we see battery technology development having a large pull in battery-driven cars, the question arises if batteries are also the ideal solution for housing applications. Compared to batteries or other hydrogen storage technologies, GKN's metal powder-based technology presents one of the most effective ways to store the energy over longer periods in compact tank sizes suitable for the residential sector. Trying to achieve long term storage with batteries would result in overly large battery sizes with safety issues. Keeping this in mind, there are strong advantages to using hydrogen in combination with renewable energy sources. Locally produced energy from systems like photovoltaic roofs, wind or water turbines can be used locally – not just when the sun shines, the wind blows, or a local water turbine runs. No grid connection is required. The Hy2green system provides both electrical power and heat. With the initial electrical energy resulting from natural and endless sources, there are no emissions other than water and oxygen. Hydrogen storage without timely limitations or losses is an advantage of using metal powders as a storage medium as it bonds with the hydrogen. This natural chemical bond results in a new solid-state material called metal hydride. This can be stored safely and is controlled easily without extra efforts like higher compression. Storing hydrogen in metal hydride is the most compact way to store hydrogen under ambient temperature and moderate pressure. Metal hydride storages are built up to 18 times smaller compared to gaseous hydrogen storage systems for the same amount of hydrogen. Compared to current residential battery technology, the metal hydride storage tank is six times smaller. Over the next months, the hydrogen team will be focusing on the full automation of the Hy2green pilot project in South Tyrol.